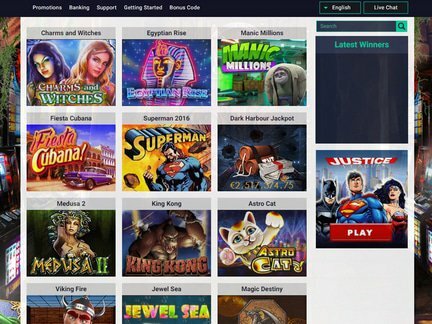 Magik Casino is an intriguing online destination that offers superior entertainment, amazing bonuses, excellent games and a dedicated team of customer service representatives. The establishment endeavours to deliver an authentic Casino experience for online gaming fanatics around the globe, from the comfort of their home. Created with a fresh look and teal blue background, the casino has in place a wide assortment of games and allows for easy and convenient navigation with easily identifiable game categories and a live casino. CasinoMagik is continuously advancing their online site by adding new games and bonus offers to their portfolio. Whether you are a high roller or play just for fun you'll have no trouble finding the casino games that provide you endless hours of enjoyment. Promotions seem to be an important part of the daily activities at MagikCasino. New players will be eligible to take advantage of a welcome package valued at €1600, based on a 400% match bonus and bonus coupon MB400. This is followed by a 50% match bonus voucher up to t€1000 when using bonus coupon MC50. High Rollers are offered a slightly better bonus worth up to €2500 on deposits of €500 and using bonus coupon MHR400. To add to the perks, a 15% alternative method deposit bonus voucher is offered for most e-wallet deposits, and a Daily calendar with exclusive bonuses for each player is featured. Simply click on the calendar and select the day, and you will be presented with your daily bonus offer. This can include free spins, no deposit bonuses, match bonuses and other treats the casino may wish to offer. Casino Magik offers one of the most generous welcome bonuses that we've ever seen; beating Casino La Vida by far. This gives you all more reason to pay a visit at this site. It should be noted however that players residing in Israel, Singapore, Turkey, UK, or the USA will not be able to register, deposit or play at Magikcasino due to regulation laws governing the casino's license. All other countries are more than welcome and there are multiple languages to choose from including English, Spanish, French, German, Italian and Russian. One country that has shown special interest to this brand is Canada. Whether it's the marketing initiatives of the company or Canada's overall interest in the branding, Canadian players comprise a particularly large segment of this site's database. Magik Casino has the luxury of calling upon a whole host of providers including ELK Studios,1X2gaming, Amaya, AGT, Betsoft, GameART, Greentube, GameScale, Thunderkick, NextGen Gaming, Leander Games. Those playing at Magik Casino for the first time will find that the gaming options available are both wide-ranging and entertaining. The site has a great collection of casino games to offer to new and experienced punters. With everything from table games to slots, their objective is to present the best online gambling experience ever. You can find all your favourite online casino games here including Blackjack, Roulette, Slots, Poker and much more! The casino app can be launched via the browser of your desktop or mobile device including iPad, iPhone and Android. Powering its game library, players will find that the interface is easy to negotiate through and as such, find the games you want is fast and convenient. All games at Casino Magik can be played for real money or for fun. This means you will have ample opportunity to learn and practice before wagering real money. The choice is yours, so start playing now! Aside from the revelations of a few tiny shortcomings in professional reviews, the casino appears to be doing a good job. The players aren't registering any complaints. Instead, the casino receives mostly positive reviews from the people who have spent some time on the website. In all fairness, the casino is still fairly new on the market. The customer support team at CasinoMagik are standing by to assist players around the clock via phone, email or live chat. The team strives to solve any issue or answer any question right then and there to assure a trouble-free gaming experience. In addition, the casino has a FAQ section that contains answers to some of the most popular questions asked by players. MagikCasino is an online betting site that launched in 2016. The site is owned and managed by Game Tech Group N.V. and operates under Master License No. 1668/JAZ, granted by the Government of Curaçao. When it comes to banking, the right methods are in place. They have selected only the safest and fastest methods for your casino payments so that you may start playing as soon as possible. Magik Casino is always updating their payment options, so please check back from time to time. At the time of writing the establishment accept deposits from multiple e-wallets and credit cards. This includes Giropay, Skrill, Neteller, Sofort, Paysafecard and Postepay for e-wallet deposits, and Visa, Mastercard and Maestro for credit cards. Financial transactions are secured by a sophisticated payments system with data protected by a symmetric 128-bit encryption. The minimum deposit is €25, and the casino does set €100 minimum withdrawals and only allows a maximum withdrawal of €3000 per month. This is something to consider if you are a regular player, especially a high roller, as the cap is unrealistic and is well below industry accepted limits. As for withdrawal times, this will range from up to 48 hours for e-wallet withdrawals and 4-5 business days for credit cards. Magik Casino, in our opinion, has a distance to go before it becomes a viable option for most players. The limited deposit and withdrawal options are not ideal and should be increased, and the withdrawal limits are neither friendly nor favourable for most players. Its game selection, however, is its shining star, and once the other areas are addressed, the casino will be a good option for those wishing to have a nice range of casino and live dealer games at their disposal.